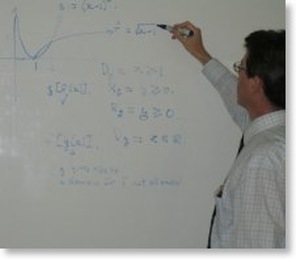 Professional private tuition in school and university level maths, physics and chemistry, is offered at our tutoring centre in Maylands by a very experienced tutor. Either Individual tuition or tutorial workshops are available at our tuition centre. Tutorials are available during term, school holidays and summer break. Email us or call on 9471 9036. Our tutorial workshops provide an excellent opportunity for students to study and do problem solving in either mathematics, physics or chemistry, with the help of a tutor. The tutorial workshops are the optimum means by which to learn. Students receive individual attention aimed at their particular educational needs. These lessons provide a kind of kinaesthetic style of learning as students are, in addition to receiving individual help and demonstration, also attempt problems themselves. The tutor is available to assist when any difficulty arises. Our workshop tutorials are in small groups of typically 2 or 3 students per tutor. The 90* minute workshops are conducted in a relaxed environment with students working in their own study areas. These tutorials are individually based, they are not class structured, allowing the tutor to provide individual assistance to each student as required. * 1 hour and 2 hour tutorial workshops are also available. Please contact our tutor for more details. Individual tuition is available for university and mature age students at our Maylands tuition centre. Mature age and university students often have very specialised study needs. Therefore it may be more appropriate for these students to have individual tuition. Our tutorials utilise detailed notes covering theory and worked examples, worked solutions from textbooks, past exam papers with solutions, sample tests, etc. The tuition centre is also equipped with scientific demonstration materials and educational software. Tuition is available for all levels of primary and high school including ATAR. We are WACE / ATAR specialists with more than 25 years experience assisting students with their final school exams. An accelerated learning program is also available for academically advanced students who wish to progress more quickly or independently of their class curriculum. One-to-one tuition for university level maths, physics and chemistry is available. We also provide tuition for graduates seeking entry to medical school via the Graduate Australian Medical School Admission Test (GAMSAT).